What should I really be keeping under the kitchen sink? Four ways to stop the space becoming a dead zone. THE KITCHEN IS primarily a utilitarian space, and so efficient workflow is an important part of kitchen design. In an ideal world, we’d carry this approach through to kitchen storage, keeping items close to where they are used. But there’s one area that often ends up as a mess of miscellaneous items, bits of Tupperware, or cooking equipment that’s rarely used: the space under the kitchen sink. The kitchen sink is where we do our washing, so it makes sense to store cleaning products underneath it. If you have young children at home (or frequent visits from younger family members), avoid storing dangerous chemicals at low-level. 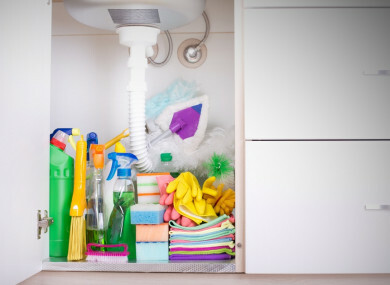 Reserve the under-sink area for milder cleaning agents, like washing-up liquid and hand soap, as well as implements like sponges and brushes. A housekeeping caddy is a handy way of keeping your cleaning supplies organised. This way, everything you need to do washing at the kitchen sink is always within arm’s reach. Store towels and cloths right where you need them, while also keeping them out of sight for a more streamlined kitchen. These €1.99 clips from Homestore & More can attach to the back of the cabinet door, so you’ll always have a fresh towel to hand. We don’t just wash the kitchen ware in our sink, we also wash our food. So the under-sink area is also the perfect place to store that spud brush, bottle brush or scrubber. Article in Dublin stock a beautiful and hard-wearing range of wooden kitchen implements. Consider hiding a pull-out bin underneath the sink rather than having your bin out on the kitchen floor. The Variera/Utrusta range from Ikea come in a range of sizes and can be retro-fitted to any kitchen. Email “What should I really be keeping under the kitchen sink?”. Feedback on “What should I really be keeping under the kitchen sink?”.